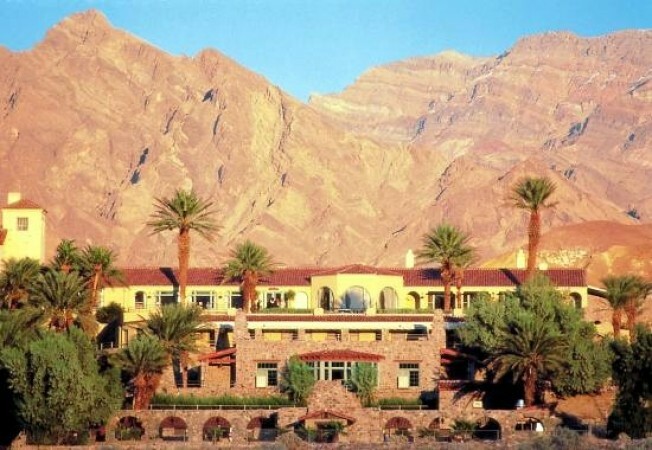 The Furnace Creek Inn closes for the summer on Saturday, May 8. Death Valley National Park:National Park Week is wrapping up; last day for free admission to any park in the system is Sunday, April 25. But we wanted to spotlight Death Valley, for its proximity, its spare spectacularness, and the fact that a favorite resort and a favorite show will be closing for the summer in a matter of days. Furnace Creek Inn: If we knew you really well, we'd probably grab your arm and say "this hotel!!!" with several exclamation points. But instead, we'll attempt some professionalism, and describe it as a majestic and remote outpost in the heart of the desert. With views. That you will. Talk about. Forever. Panamint Mountains in the distance. Closing date: Furnace Creek Inn closes for the summer on May 9, 2010 (making its final night May 8). Furnace Creek Ranch, the Inn's less-dressy sib, is open all summer. Amargosa Opera House and Hotel: We've called this a magical place. Maybe we weren't strong enough, even. Ballerina Marta Becket has a simple, unadorned inn and highly adorned opera house, where she produces a twice-a-week show. Another performer has taken the lead in recent years. Picture it: A mysterious opera house in the middle of a vast and silent desert. If you're feeling neck prickles, you should go. Closing date: May 2, 2010; no opening date is yet listed for the fall.